Google’s new camera app for Android devices running on the Kit Kat operating system, which is unsurprisingly called Google Camera, is available today. According to a post on Google’s Research Blog, the best thing about the new app is its cool new Lens Blur feature. 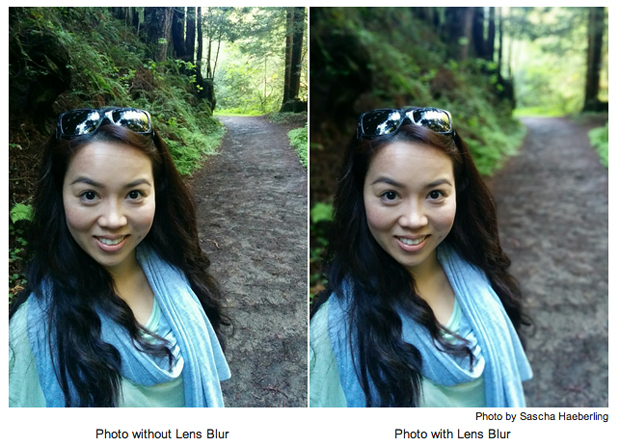 The Lens Blur mode will allow users to take a regular photo and then tweak its point or level of focus afterwards – check out the example shots above for a pretty cool before and after. Unlike Instagram, which only allows its users to select two basic blurring effects, you’re able to choose to make any object come into focus more simply by tapping on it within the image. You can then alter the depth-of-field slider and simulate different aperture sizes to achieve bokeh effects. For up-close shots of faces it would really make your subject’s features pop to subtly blur in the background, but for cityscapes you could push it to the extreme to create a tilt-shift (or miniature) effect. Google explains that the algorithms it’s used to create these 3D photos run entirely on mobile devices, and are related to the computer vision algorithms used in 3D mapping features like Google Maps Photo Tours and Google Earth.